Steve McQueen’s magnificent portrait about the awful truth of slavery in the land of the free (and here: home of the bullies and cowards) is a cinematic masterpiece, the likes of which make it to the screen so very rarely in our current era of worth-by-box-office evaluation. The opening twenty minutes is a miracle of non-linear storytelling—replete with sound overlaps which, deliberately used sparingly, add further depth to the already rich visual and aural fabric. Surely the Academy will only nominate one picture as its “Best” this year (not a chance, of course: see “worth-by-box-office,” above). 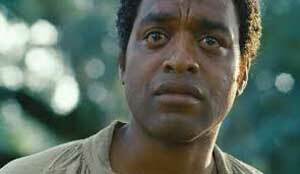 Similarly, it’s hard to imagine anyone but Chiwetel Ejiofor taking home the Best Actor Oscar, playing Solomon Northup. The nightmares he must still have (especially being forced to beat a fellow slave as an asked-for blessing compared to Master’s unforgiving whip), knowing that these atrocities and inhumanities are based on fact, are unimaginable. Perhaps Ejiofor’s finest moment is the extra-long head shot where his ever-expressive visage reveals his thoughts, hoping against all hope that he will, once again, become a free man. Lupita Nyong’o’s performance as Patsy is also unforgettable. Leading the plantation’s workforce by picking over 500 pounds of cotton a day, only to be beaten and raped by her evil “Master” and jealous “Mistress” after-hours, fuel the incredible array of emotion that Nyong’o so fearlessly shares. (Incredibly, Michael Fassbender adds still more to his reputation as one of today’s finest actors, portraying the heartless owner of human “property”; Sarah Paulson oozes contempt from every pore as the unwanted woman of the house—disgusted by her husband bedding a black heathen rather than worshipping at her sterile temple). 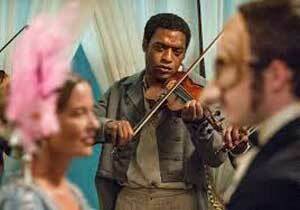 Hans Zimmer’s score superbly gets under the skin of the cast—black or white—even as the downtrodden sing in the fields or—tellingly, the moment Ejiofor joins in—belting out “Roll Jordan Roll” over the graveside of one of their “family.” That the same God serves both slave and master is one of the film’s many understated ironies. Too many highlights to list, there is a spectacular scene where Master and Slave come to blows; McQueen shows the depth of his imagination and special ability to show his points rather than make them when he has Fassbender slip and fall amongst the filthy hogs in the estate’s pigsty: What more needs to be said? By journey’s end the indisputable fact as to how the righteous on the planet treat those deemed unworthy of any sort of respect or decency will make most of us ashamed to be in the same “human” race. (The others will wonder why there weren’t more lynchings to entertain their own fantasies—some of which are acted out daily around the planet…).